LightWorks Lecture Series: What Can 19th Century Literature Tell Us About Energy? (Friday, April 3, 2015) Kent Linthicum, Department of English, Arizona State University will present What Can 19th Century Literature Tell Us About Energy? From 12:00-1:15 p.m. in room 481, Wrigley Hall, Arizona State University at the Tempe campus. More information and RSVP. (Tuesday, April 7, 2015) The mission of the Farmers Market at ASU Tempe is to promote sustainability, healthy eating and green living practices among our students, faculty and staff by providing educational opportunities and convenient access to a variety of locally grown and produced foods through a learning-living partnership with Arizona farmers and artisans. From 9:00 a.m.-2:00 p.m. on the Student Services lawn. More information. (Tuesday, April 7, 2015) Thomas Selling, Cox School of Business, SMU will present How Financial Reporting Rules Thwart Corporate Investments in Solar Projects from 12:00-1:15 p.m. in Wrigley Hall, Arizona State University at the Tempe campus. More information and RSVP. (Tuesday, April 7, 2015) This cinéma vérité style documentary presents a fresh look at the genre and ground-breaking architect Paolo Soleri. Doors open 6:30 p.m.; showtime 7:00 p.m. at Harkins Valley Art Theater, 509 S. Mill Ave, Tempe. More information and RSVP. (Wednesday, April 8, 2015) Theodore Bohn, Decision Center for a Desert City and School of Earth and Space Exploration will present Land-use Change and its Effects on the North American Monsoon from 12:00-1:30 p.m. in the Conference Room, Decision Center for a Desert City, 21 E 6th St, Ste 126B, Tempe. Please RSVP to katie.peige@asu.edu. More information. (Thursday, April 9, 2015) Donna Gerardi Riordan, Research Now will present Research Now: Science for the People 2.0 from 12:00-1:15 p.m. in room 481, Wrigley Hall, Arizona State University at the Tempe campus. More information and RSVP. (Thursday, April 9, 2015) Come learn how you can help the ASU Sustainability headquarters, Wrigley Hall go Zero Waste! From 2:00-4:00 p.m. in the 1st Floor Breezeway, Wrigley Hall, Arizona State University at the Tempe campus. More information. (Friday, April 10, 2015) Matthew Cohen will defend his PhD dissertation Aligning Public Participation Processes in Urban Development Projects to Local Context. Faculty, students, and the general public are invited. More information. (Friday, April 3, 2015) L.S. Fan, Department of Chemical Engineering, Ohio State University will present Chemical Looping Technology Platform – Metal Oxides, Reactors and Processes at 10:30 a.m. in the Marston Exploration Theater, ISTB4, Arizona State University at the Tempe campus. More information. (Friday, April 3, 2015) Dan Segalman, Department of Mechanical Engineering, Michigan State University will present A Robust Approach to Quantification of Margin and Uncertainty at 1:30 p.m. in room H153, Physical Sciences Building, Arizona State University at the Tempe campus. More information. (Friday, April 3, 2015) Marco Mangone, Karen Anderson, and Jason Newbern will present talks from 2:00-3:00 p.m. in room E104, Life Sciences Center, Arizona State University at the Tempe campus. More information. (Monday, April 6, 2015) Larry W. Lake, Department of Petroleum and Geosystems Engineering, University of Texas-Austin will present Scales, Scaling and Scale Up at 10:30 a.m. in the Auditorium (105), Biodesign Institute, Arizona State University at the Tempe campus. More information. (Tuesday, April 7, 2015) Helga Nowotny, European Research Council and Swiss Federal Institute of Technology will present The Cunning of Uncertainty from 3:30-5:00 p.m. in 6th Floor Boardroom, Fulton Center, Arizona State University at the Tempe campus. Seating is limited. More information. (Wednesday, April 8, 2015) Susan Spierre Clarke, School of Sustainable Engineering and the Built Environment will present Climate Change, Games, and Resilience: A Sampling of Research by an Interdisciplinary Scholar from 12:00-1:00 p.m. in room 5536, Coor Hall, Arizona State University at the Tempe campus. More information. (Wednesday, April 8, 2015) Dave Schimel, JPL Science Division, NASA will present The Carbon Balance of the Amazon Basin and its Feedback to the Global Climate System from 1:45-2:45 p.m. in room EB04, Life Sciences Center, Arizona State University at the Tempe campus. More information. (Thursday, April 9, 2015) Michael Guven, University of California-Santa Barbara will present Is Cardiovascular Disease Inevitable? Insights from the Bolivian Amazon from 12:00-1:00 p.m. in E232, Life Sciences Center, Arizona State University at the Tempe campus. More information and RSVP. (Thursday, April 9, 2015) Miklos Lukovics, Faculty of Economics and Business Administration, University of Szeged will present Eastern Europe RRI: Territorial Differences & Economic Backgrounds from 11:30 a.m.-1:00 p.m. in room 225 (Yuma), Memorial Union, Arizona State University at the Tempe campus. More information and RSVP by April 6. (Saturday, April 4, 2015) Citizens' Climate Lobby is a national organization dedicated to the implementation of a revenue-neutral carbon tax. The Phoenix-area CCL group meets at 10:00 a.m. on the first Saturday of each month to plan its efforts. The location is as follows: Escalante Multi-Generational Center, 2150 E. Orange St. in Tempe. For more information, visit http://citizensclimatelobby.org or e-mail pe4rcaz@gmail.com. (Wednesday, April 8, 2015) The mission of the Arizona Science and Engineering Fair is to support and provide guidance to students and teachers throughout Arizona to ensure the continued availability and vitality of this statewide celebration of scientific inquiry for the citizens of Arizona. The judging and public day is held at the Phoenix Convention Center. More information. The story goes that when beetles were discovered in the eaves of the great hall at New College in Oxford, everyone began wondering where they could possibly find replacements for the gigantic timbers that had held up the roof for hundreds of years. Read more. If we hope to secure solid solutions to such herculean sustainability quandaries as climate change, deforestation and water scarcity, we must be willing to venture well beyond the basic, and even consider what initially seems inane. Many companies already are doing that. Read more. As more people move to different regions of the country, it will require planners to use as many tools as they can to develop urban areas that satisfy population demands without over-burdening the environment. Read more. Continuing to lead innovation in online education, Arizona State University is piloting a series of environmental science games at ASU Online. Within each of the five story-based games, students will take on several leadership roles, with increasing responsibility, to help a community address challenging environmental and sustainability issues. Read more. Aging infrastructure is among the most pervasive and critical global challenges. Countries around the world face potentially perilous consequences from the corrosion of structures on which their transportation, resource management and public safety systems depend. Read more. Solar panels already face enough technical challenges when it comes to efficiency — that is, the amount of power they produce per module. Israeli robotics startup Ecoppia wants to ensure that dust or other airborne particles don’t compound the problem. Generally speaking, soiled panels can reduce potential production by up to 35 percent, according to the company’s estimates. Read more. 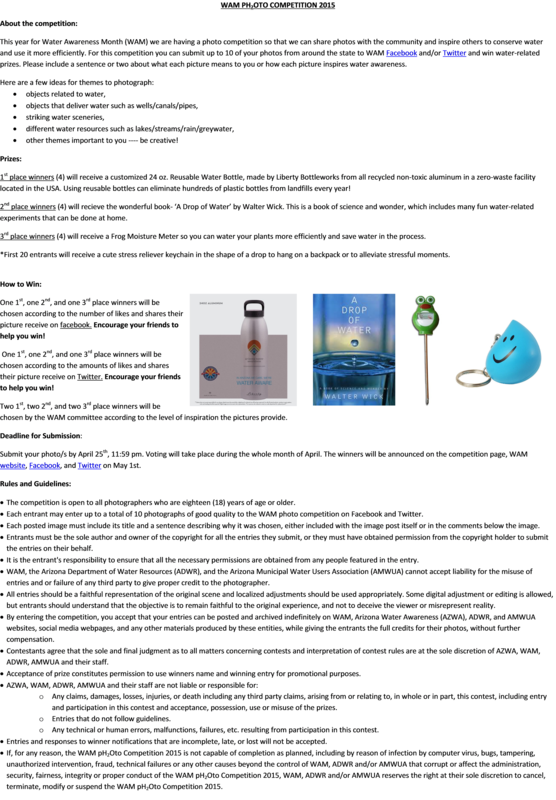 The Arizona Department of Water Resources and the Arizona Municipal Water Users Association are holding a photo contest about water awareness. More water awarness information may be found at http://www.waterawarenessmonth.com/. Photo submission deadline is April 25, 2015. More information on contest and rules. To review and apply please go to https://students.asu.edu/employment/search, click on "Search On-Campus Jobs" and enter the requisition ID 11881BR. Application deadline April 9, 2015. More information. Application deadline April 10, 2015. More information. Four fellowships. Application deadline April 10, 2015. More information.